Performing arts centre, opened 16 Oct 1985. 1511 seats. Home to the Thunder Bay Symphony Orchestra. 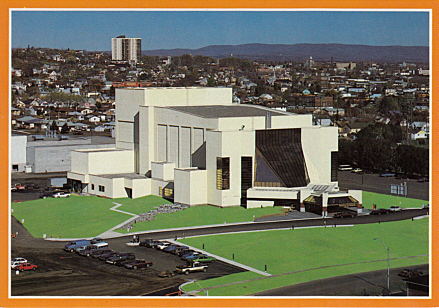 Reverse Text: "Thunder Bay Community Auditorium, Thunder Bay's total Entertainment Centre, 1500 Seat Performance Theatre - three levels for hosting - great entertainers perform here, Bob Hope Roger Whittaker, Irish Rovers, Red Skelton, Glenn Miller Orchestra, Royal Winnipeg Ballet, many more. - Located in the 'Heart of Thunder Bay'"